As you already know it was an extremely ugly day due to the Dubai mess and it could have been much worse. This is most likely the reason the GLD call options exploded today. My plan this morning as I looked at the futures, was to be closing as many short call positions on stocks like: Google (GOOG), Apple (AAPL), Bank of America (BAC) and Las Vegas Sands (LVS) and opening as many short put positions on the following stocks: Corning (GLW), Visa (V), Bank of America (BAC) and American Express (AXP), as I believed we would see the market gain strength going into close. After seeing many of the call contracts I closed early this morning almost double in value from the price I purchased them for, I decided it was time to sell premium before the weekend again. I reopened my short call positions on Google, Apple, and Las Vegas Sands, but never got my ask filled on Bank of America (BAC). Today is Wednesday November 25, 2009 and I am in a selling mood, not because I am extremely bearish but because I see a potential profit play. I am looking to sell covered calls on some of my holdings. If you're thinking about selling covered calls like me, today may be the day to do it! This won't make anyone rich but it's simple, safe, and may give a couple extra dollars to spend over the holiday's. In this article I will outline five covered call ideas for Wednesday's trade. The reason I plan on selling covered calls today, is because I am taking advantage of time decay. The amount an option contract decays each day (holding everything else constant) is known as Theta, and is your friend when you're the seller. With the market being open three and a half hours (market closes at 1 PM Friday) over the next four days, option contracts should decay. Premiums should be higher going into the close Wednesday than they will be Friday morning, likewise premiums should be less Monday morning than they were at close Friday. I don't expect too much action Friday, so I am choosing to write my shares out Wednesday. Since I plan on writing covered calls on my positions anyway, I believe it may be beneficial to get short theta Wednesday versus next week. With some of my positions such as Apple and Google, I may look to purchase back the call if profitable when trade resumes Monday, and wait to write it out again on strength in the underlying. It is very important to take into account brokerage commissions as the margins may be very thin. It is also important to note the strike prices I have chosen are prices I am willing to sell my stock at in case a significant move higher occurs in the market. The five ideas are listed below using data as of market close Tuesday. The table below shows the company, ticker, call option strike price, current theta (or decrease in the call option contract holding everything else constant), and potential return if stock is assigned at expiration. To better understand options in general, including this strategy, these percentage calculations, and other option strategies please check out my Simplified Stock Option Trading E-Books. As a shareholder of Bank of America, I use this strategy to sell calls on strength and buy them back on weakness. This allows me to generate income off my shares and lower my cost basis, as the volatility of the underlying stock gives a very nice premium, even on out of the money options. The list above are stocks which I wouldn't mind holding in my portfolio if they do not get exercised at expiration. These are just examples and are not recommendations to buy or sell any security; if you're more bullish/bearish, you’ll want to adjust the strike price and expiration accordingly. This strategy allows for some profits to be taken off the table. This is ideal especially when the market has rallied as much as it has. This strategy will give some protection if the market sells off, as well as provide a return if the market continues to rally. If the stock is not assigned, this strategy is a great way to create additional income for your portfolio. The reason option volumes have surged in the last 5 years is because they are a great way to hedge your portfolio as well as create income off of your shares (see chart here). Keep in mind when using this strategy it is essential that broker commissions are low enough to profit from the position. With the NYSE trading almost 1.5% higher Monday, it's no surprise that there were 21 breakout stocks on big volume that made my post. As always, the first thing I do is scan the list for familiar names, such as stocks which have appeared on similar scans multiple times in the past week or two (most of these names are unfamiliar so it saves a lot of time, especially with larger lists). This indicates there may be some real momentum behind the stock, and that it could trade higher in following sessions as well. Then (if and when any of the stocks I find are familiar to me), I take a look at the chart(s) to see if I can structure a potential option trade. As stated, in this post I will name 21 stocks, but only write about one in detail and outline an option trade I may look at opening in the near future. This method is just one of the ways I use to find stocks for potential option trades. The first part of this post will show the list of stocks which traded higher on above average volume. The second part of this post requires the knowledge of stock options. To learn more about the option strategies outlined in this post, risks, pricing, calculations, other strategies, and options in general, click here. 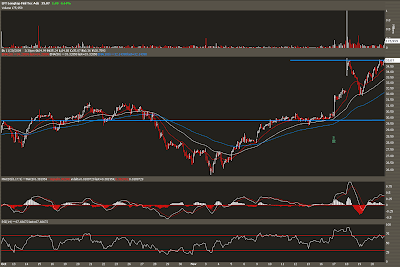 One stock from the list above which has appeared a number of times lately is MercadoLibre, Inc. (MELI). This stock has been on a tear since they reported earnings on November 4, 2009. First I will give a company profile from Google (GOOG) Finance below. MercadoLibre, Inc. hosts an online platform in Latin America, called MercadoLibre and located at www.mercadolibre.com. The Company has e-commerce operations in Argentina, Brazil, Chile, Colombia, Ecuador, Mexico, Peru, Uruguay and Venezuela. In addition, it also operates online trading platforms in Costa Rica, the Dominican Republic and Panama. MercadoLibre has two principal services: The MercadoLibre marketplace and The MercadoPago online payments solution. The MercadoLibre marketplace is a fully automated, topically arranged online trading service. The MercadoPago online payments solution is an integrated online payments solution. During the year ended December 31, 2008, visitors to its Website were able to browse an average of over 2.5 million total listings on any given day in over 2,000 different product categories. At December 31, 2008, the Company had over 33.7 million confirmed registered MercadoLibre users. MercadoLibre is a lot like Ebay (EBAY), but they are much smaller which means they can grow much bigger. 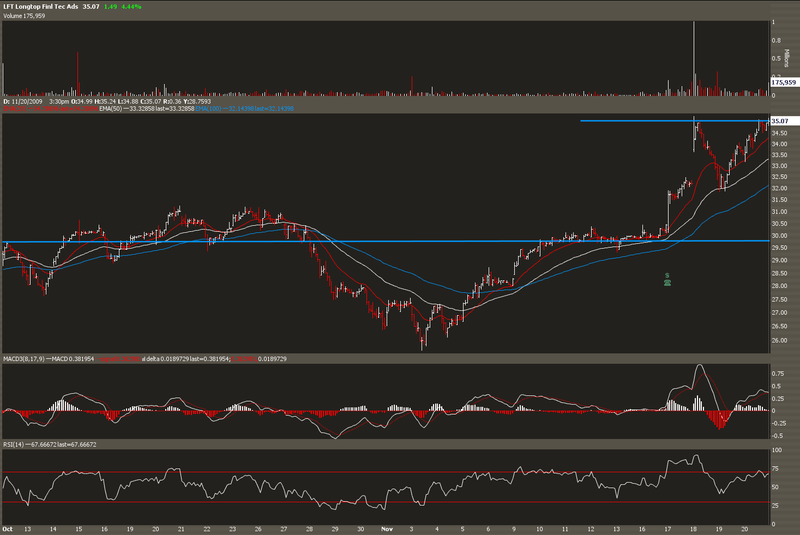 It is clear this stock has momentum behind it, so I certainly wouldn't mind getting long. Therefore, I will be writing a detailed option strategy about MercadoLibre, Inc. in this post today. 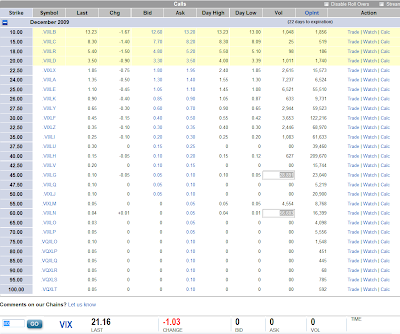 Note that many of the stocks listed above will be good plays and many will be bad plays, I list them all to show possible breakout stocks and write about a few of the ones I am interested in trading. I believe this stock is a bit overbought short-term, so before I jump in, I would like to see it pull back a bit on lighter volume. The 20, 50, and 100 day moving averages come in near 47.50, 46.75, and 46 respectively, but I believe this stock could trade down to levels of support near 45 a share; note it is critical that it holds support otherwise it may head even lower. If I see this stock bounce off any of the moving averages, I may also use that as my entry point. I would look to open Vertical Call Spreads on MELI when I am ready to get long. MercadoLibre, Inc. Vertical Call Spread Option Trade: This is a fairly simple trade to open and only requires the use of two separate option contracts, the December 50 & 55 Call options. I would simply purchase December 50 strike call contracts and sell the December 55 strike call options against them. The theoretical price for this spread as of close Monday is roughly $130 per option spread. This will give me both limited risk and limited gains, but considering the stock has added value this fast, I am more than willing to pay some premium. It is also important to highlight that both contracts look as if they have gaining interest, on Monday the December 50 calls traded over 2 times the number of contracts open, and volume for the December 55 calls traded about 80% of open interest. Profit and Loss: Let's say I opened just one spread. If MELI sells off significantly, this strategy would lose a maximum of $130 per option spread. Now let's assume the stock continues to rally and closes at December option expiration at or above $55, this position would return maximum profitability, $370 per option spread or 285%. It is worth noting the break even point for this strategy, it is $51.30 a share of MELI, therefore anything below this level in the underlying will result in a loss, and anything above at December options expiration would result in a profitable option trade. The sentiment from today's most active options seems very bearish, excluding the December 60 strike call options on the Volatility Index. I believe this position is the outcome of one trader hedging his/her portfolio. If you look at the OptionsXpress December VIX option chain below, you can see that nearly double the amount of VIX 60 strike calls traded than the December VIX 45 calls, the 45 calls were pretty much financed by the 60 calls. This trader expects volatility to rise near term, but not by more than 75. 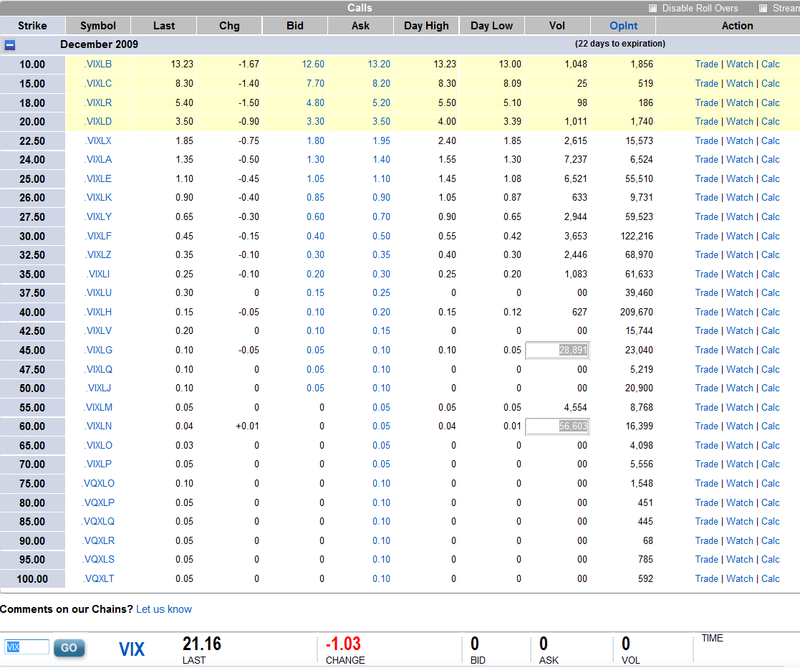 The break even for this trade would be roughly 75 on the VIX. With the market trading relatively flat on November options expiration Friday, there were several stocks that hit my radar which traded higher on BIG volume. In this post, I will name 11 stocks which traded higher Friday November 20, 2009. I will be checking these stocks frequently to see if there is continued buying pushing the stocks higher. This method is just one of the ways I use to pick stocks to structure particular option trades. The second part of this post requires the knowledge of stock options. To learn more about the option strategies outlined in this post, risks, pricing, calculations, other strategies, and options in general, click here. One stock from the list above which has appeared quite a few times on my daily breakout stocks on big volume screen is the software company Longtop Financial Technologies (LFT). This stock has been on an absolute tear lately. 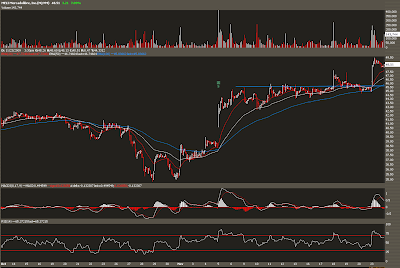 Therefore, I will be writing a detailed option strategy about Longtop Financial Technologies (LFT) in this post today. Note that many of the stocks listed above will be good plays and many will be bad plays, I list them all to show possible breakout stocks and write about a few of the ones I am interested in trading. Looking at the chart above, we can see this stock moved sideways until recent. 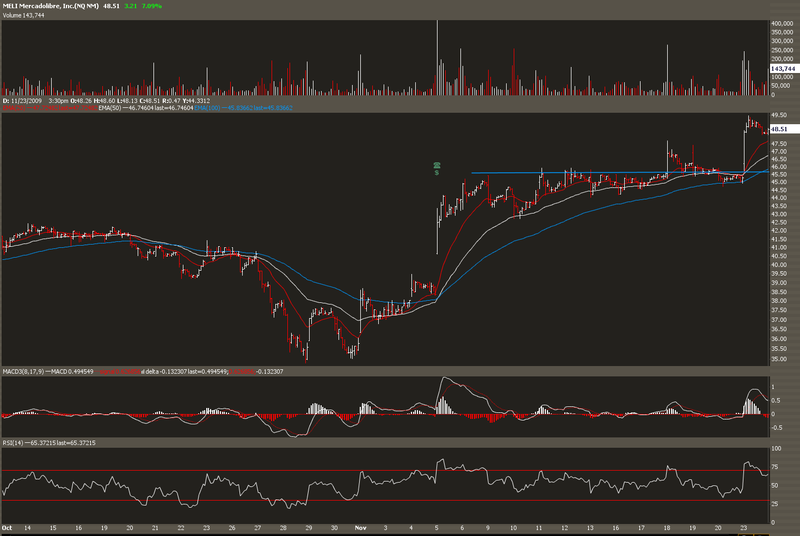 We can see there is some serious support around the 30 per share range, and resistance around 35. This stock set a new 52 week high at 35.40 on Wednesday November 18, and on Friday it came within six cents of making a new 52 week high, before it traded off its highs to close the day at 35.07. This stock has some serious momentum behind it and could make for a nice trade, however I need to see it make a new 52 week high on above average volume to really give it my blessing. If this stock fails to make a new 52 week high I believe it could trade lower to support and would look at purchasing Vertical Put Spreads, however if this stock trades higher to a new 52 week high on above average volume I would look to purchase Vertical Call Spreads. Longtop Financial Technologies Vertical Put Spread Option Trade: As stated I am expecting a slight sell off if this stock fails to make a new 52 week high on above average volume. I would become a buyer of Vertical Put Spreads if the stock traded below 34 a share (minor support level) on above average volume. First I would look to purchase December 35 strike put options on LFT, and then I would choose to lower my cost by selling the December 30 strike put options (support level) against them (1 for 1). Using market data as of close Friday, each vertical put spread would result in a net debit of $145 (paying $145 cash). Profit & Loss: If Longtop Financial trades down near support levels (assuming this position is opened), and closes on December options expiration at or below 30 a share this strategy will return $355 or 245%. If Longtop Financial trades higher after this position is opened and closes at or above 35 a share at December options expiration, this strategy will lose 100% of the premium paid or $145. The break even point for this option strategy is Longtop financial at 33.55 a share at December options expiration. Longtop Financial Technologies Vertical Call Spread Option Trade: If however LFT makes a new 52 week high on above average volume, I may be convinced to open vertical call spreads on this stock. Using this strategy, first I would look to purchase December 35 strike call options on LFT, and then I would choose to lower my cost by selling the December 40 strike call options against them (1 for 1). Using market data as of close Friday, each vertical call spread would result in a net debit of $150 (paying $150 cash). Profit & Loss: If Longtop Financial trades higher (assuming this position is opened), and closes on December options expiration at or above 40 a share this strategy will return $350 or 233%. However if Longtop Financial trades lower after this position is opened and closes at or below 35 a share at December options expiration, this strategy will lose 100% of the premium paid or $150. The break even point for this option strategy is Longtop financial at 36.50 a share at December options expiration. Both of the strategies outlined above require the underlying stock to move in the indicated direction and should not be considered if you think the stock will move sideways in the near future. However if you feel the stock could move to the higher call strike price or to the lower put strike price in the near future, either strategy could yield a nice gain. To get a better understanding of stock options and different option strategies please check out my Simplified Stock Option Trading E-Books. These are just examples and are not recommendations to buy or sell any security; if you're more bullish/bearish, you’ll want to adjust the strike price and expiration accordingly.